The Sancho Panza brand has been around since 1848 paying homage to the faithful squire of Don Quichotte, today it is to the vailant Don Quichotte himself (El Valiente Ingenioso Hidalgo Don Quijote de la Mancha) that we give thanks to. This is the first time that the Swiss importer Intertabak offers this brand in a Regional Edition. The choice of the module remains just as the original: discovered in 2010 with the Wide Churchill, this corpulent size of a ring gauge 55 and a length of 130 mm, has only been produced for 1 Limited Edition and for some Regional Editions - which you will find elsewhere in our walk-in. For the tasting, there are nice surprises for this cigar, freshly out of the hands of Cuban toredors. Raw, notes of fresh wood and cinnamon. After lighting, it quickly develops earthy flavors with hints of Sichuan pepper reminiscent of the classic characteristics of the brand. The draw is easy and the evolution moves towards a character marked with vegetal notes and even tannin. 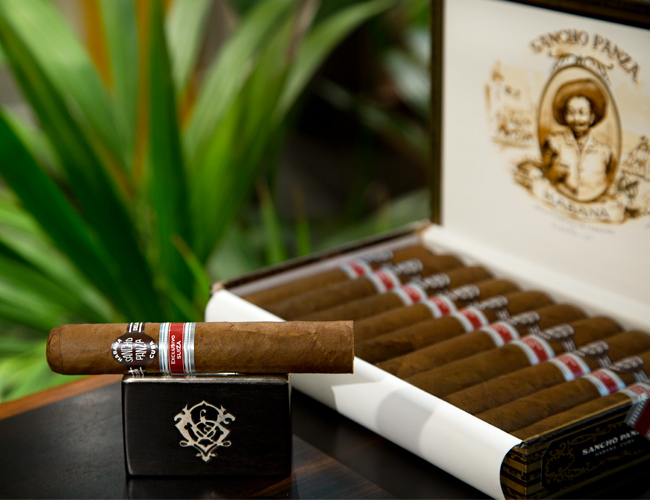 With the launch time during Autumn, this cigar will allow you to accompany perfectly with your game dinners. And like with certain great wines, it is a cigar to be put away for aging. Like all Regional Editions, production is limited. Only six thousand numbered boxes of 10 Valientes will be produced.